I went to the pasar malam (night market) last evening after laying off that place for the longest time. You know, I used to visit most of the night markets in my area but after doing so for some weeks and seeing the same vendors hawking the same wares no matter where I went, until I don’t even know where I was, I gave up. Last evening, though, I went to Ipoh Parade but there was a “jaga kereta” guy there and I thought I’d rather not stop there. Seriously, the authorities should do something about it. I’ve seen this guy there three times already and I shudder to think what happens if a girl drives up there alone, stops her car, or enters her car and something happens to her and nobody would even know who did it. 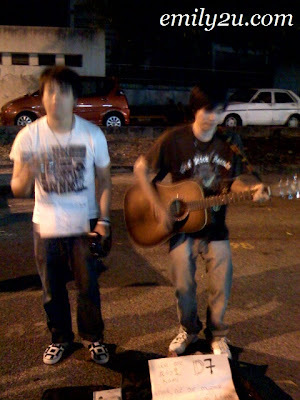 Anyway, I backtracked to Stadium Perak after going all the way to Ipoh Parade (GGrrrrrr) and I saw these two guys busking. I only had my iPhone with me so please excuse my fuzzy pictures but hey, here’s free plug for ’em! I thought that they were there to promote their CD and they plan to play music like this in a hundred locations, probably most of them will be in Ipoh seeing that these guys are from Kuala Kangsar, yes the royal town. It looks like they will be travelling with basic instruments in two suitcases and some pieces of paper introducing themselves as D7 the two men band and directing us to their MySpace music site (visit ’em: http://www.myspace.com/d7gate). 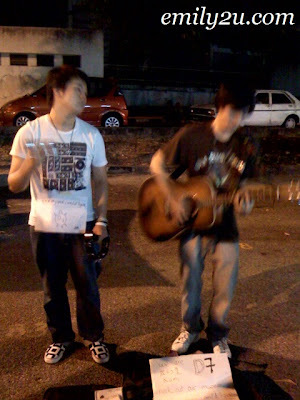 Like I said, I thought that they were there to promote and sell their CDs, though I have to say that I hardly heard their music at the night market. They should have brought along a microphone, loudspeaker or something. But then I just checked their MySpace site and they say that it’s up to us to pay how much we want. I wonder if they meant the price of their CD. They should be more precise. Also, D7 is introduced as a “two men band” and they will play in a hundred different locations but then they have photos on MySpace that show four guys and a girl. I’m so confused already! If you support local musicians, perhaps you should check them out.